Worried about the presence of radon gas in your home? In the process of remodeling your home and concerned you might be disturbing lead-based paint materials or asbestos-containing materials? Worried about a moisture problem in your home and possible mold? If you answered yes to any of the questions above, we can help you. Our trained and certified inspectors can assess your situation and determine the best process for addressing the problem. We provide many services to help you ease your mind about a renovation project or a possible health hazard in your home. Are you a contractor or a homeowner renovating a home and you need to confirm whether existing materials contain lead-based paint, asbestos, or mold? Test for asbestos if there are any materials that are suspect. Asbestos can be found in homes built as late as the 1980s. 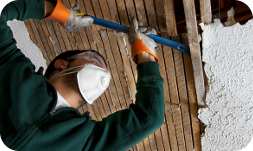 Common materials that may contain asbestos include ceiling texture, floor tiles and adhesives, pipe insulation (wrap), vermiculite insulation, and some roofing materials. Test for mold if there have been any persistent moisture issues in the home or if there is visible mold (to determine the levels of mold spores prior to cleaning or removing affected areas). 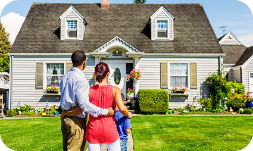 Are you a bank representative attempting to help a new homeowner close on a mortgage for a real-estate owned (REO) property? The buyer may need lead-based paint clearance testing prior to the closing (a test which is performed after lead-based paint abatement has been completed). Or, if there is an issue with mold or asbestos in the home, the buyer may need testing to identify specific areas of concern. Our trained and certified inspectors can provide you with the testing and documentation you need to complete the project. 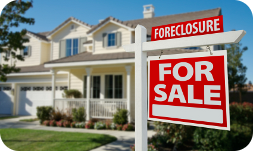 In addition, we have inspectors who have worked with bank foreclosure properties for more than 10 years and are familiar with all aspects of maintaining a property in a safe, secure and sanitary condition until the property can be re-sold. We are familiar with all requirements for routine property inspections, snow removal, lawn maintenance, and general repairs.